Highly revered in various Indian cultures for over 3,000 years, our Tulsi Holy Basil Tea is a real treat to mind, body and soul. This herbal loose tea is largely considered to be the earthly manifestation of the Hindu God, Vishnu, and is traditionally used in religious ceremonies, as well as in ayurvedic medicine. Yet, Tulsi Holy Basil Tea is not just limited to India. In fact, this tea has become increasingly popular since many Scientific Studies have indicated its incredible health benefits for a vast number of ailments. From common colds to headaches; stomach disorders to heart disease – Tulsi Holy Basil has taken the world by storm! 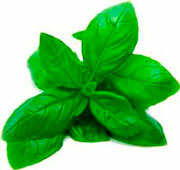 Often known as ‘the Queen of Herbs’, Tulsi Tea (Ocimum tenuiflorum) or, ‘Holy Basil’, is a member of the mint family. Some of the earliest records of its usage date back to at least 1,500BC, as mentioned in the Rigveda, an ancient Indian collection of Vedic Sanskrit hymns. However, many historians also believe that the consumption of Holy Basil Tea predates this publication, and may have been enjoyed in tea-form for over a thousand years before. This will likely remain a mystery, but what we do know is that Tulsi Holy Basil Tea is far from a new creation! Native to much of Southeast Asia, this nourishing herb has been consumed in tea-form for natural remedies over the course of many centuries. It is rich in vitamins A & C, as well as calcium, zinc, iron and chlorophyll – essentially meaning that there is more to this beverage than just it’s fascinating history! Brewing Guide: We recommend using 1 teaspoon of the leaf, but if you like a stronger tea, then you could us up to 1½. This tea tastes best with freshly boiled water (roughly 100 degrees) and left to infuse for 6 to 8 minutes. How to Serve: Depending on personal taste, the addition of honey or lemon can be a delightful inclusion into this beverage. However, we believe it is best served as it is. Tasting Notes: With its invigorating earthy aroma and irresistible minty flavour, this beverage shares only minor comparisons to its sweet basil counterpart. Refreshing and smooth with every sip, you will enjoy slightly spicy aftertastes dancing on your palate long after you have drained your cup. Colour in Cup: Golden-brown liquor, dark in tone. Health Benefits: Had a rough day at work? Consider brewing up a nice, warm cup of Tulsi Holy Basil Tea to help you relax. In fact, this beverage is known for promoting mental balance within the body, and can help reduce stress, anxiety and even, in some cases, depression! Further to this, since the mid-1990’s, the Tulsi herb has been associated with maintaining blood glucose levels in those living with diabetes, and if that wasn’t enough – it is also caffeine free!